Getting Wow! Wow! Wubbzy! A Tale of Tails was a bit of a gamble, but my 4-year old likes it so that is what counts. It certainly appeals to its target demographic. My 8-year old thinks it is okay, but it is by no means a favorite. This disk has the first eight episodes of Nick Jr.'s Wubbzy and a few extras. If there is a preschooler in your home, I don't see how you can go wrong with this $10 purchase. It really appeals to the 3-7 demographic, with simple stories that have good message, simple yet flashy graphics, and a catchy theme song that will stick in your head for days (you are SO right Amanda). The 3 main characters interact in a very basic manner and without other main characters to complicate things. I suppose this appeals to the younger set and the voice acting is good. The animation is almost comic book/vintage video game- like, very angular and 2D, yet it helps to create the disctinctive Wubbzy world. All that said, my 4-year old daughter still likes SpongeBob better. This indicates to me that a kid's show does not have to pander to a certain age group to be successful and well done. Shows like SpongeBob SquarePants, Thomas & Friends and Chowder have a broader appeal across a larger age group and stand the test of time. I can't see Wow! Wow! Wubbzy! doing that, but it is "safe." I don't think anyone would object to having their little one watch this program. If you want "safe" and "formulaic" for your children, and want them to watch programming with a positive social message, then you could do worse than this DVD. Personally, I like a bit more of an edge, a bit more intelligence. And so do my kids. For myself this show is not. But i do have young kids here at home and my youngest son loves this. The show is simple but it keeps him entertained and any parent will tell you that is important when you need to get a few minutes peace. Adults and older kids shouldn't try to watch these cartoons. The characters deliberately speak slowly and repetitively to get the really young kids up to speed. My daughter is four years old, and it is sometimes difficult to find things that she likes to watch, and I can tolerate. I find that shows that are shorter tend to be better, because they have more content. Consider, for example, the difference between a standard episode of Dora the Explorer compared with a movie version of the same show. The episodes have a lot more content, and the movies have lots of slow, boring filler. That's why shows like this one, which are about ten minutes each, are a good choice. It is short enough to watch at least one complete episode, even with a short attention span, and doesn't drag on like a 30 minute show would. The show itself has lots of fun, active animation in bright, clear colors. On DVD, the little guy (whatever he is -- my daughter thinks he is a yellow squirrel!) pops right off the screen. The sound is clear, and the music entertaining, though simple. The collection of episodes seems like a good variety, and together they add up to about 90 minutes. So, while it is movie length, there isn't that feeling that you need to sit for 90 minutes and watch the entire thing in one sitting. Which is a very good thing for the adults in the room. For the length, the price is right, too. Recommended (if you have a little one to enjoy it with). It's nice to find a kids animated show that has short enough episodes to keep even a toddlers attention span, fun and inventive stories, often with a moral, and also some subliminal education. As a parent I often despair at what I consider stupid animation aimed more at young adults than children. Wubbzy has the mix about right, and with the pedigree of Nick Jr behind it, you know that your child won't be watching anything questionable. There are 6 episodes, plus 2 bonus ones for a combined run time of 92 mins, which is pretty good value. There are some interactive features too, some printable stuff for your pc, a music video and a game. For those kids learning French there is also a French language track. Overall 4 stars. My 4 year old loves it, whereas my 5 year old (soon to be six) probably needs something more involved. Wow! Wow! Wubbzy! Wubbzy! Wubbzy! Wow! Wow! "Wubbzy lives in a tree. He likes to play! Play! Play! And he likes it that way! I dare you to listen to the Wubbzy theme song and not sing along. No, I DOUBLE dare ya!! Although this loveable cartoon is for a much younger age group (preschool), older kids will also get a kick out the funny characters and Pac-Man style simple animation. The main character is a squarish yellow creature with a long tail that can bend into any shape, including a spring, which he uses from time to time for rapid locomotion. His friends are an overly-enthusiastic female rabbit inventor named Widget, and a bespectacled and very intelligent purple creature named Walden. Each has a catch phrase of their own, which kids will soon be repeating ad nauseam. This DVD contains 8 episodes from Season One, and is the first DVD released from the series. Each episode has a positive message for kids, such as being comfortable with who you are; not touching things that don't belong to you; telling the truth; the importance of reading instructions; the joys of having friends, and much more. It may drive parents crazy, but kids will love it. So the next time your child utters the phrase "That's koooky", rest assured that he/she heard it on this show, and not from your psychiatrist or mother-in-law. Caution: There are already over sixty episodes, so be prepared for multiple DVD purchases. Helpful hint: Christmas is coming. Recommended for any preschoolers on your list. My son love's this DVD. He never gets sick of it no matter how many times he has seen it. Wubbzy teaches children solid lessons in a fun way on the new Nick Jr./Anchor Bay DVD "Wow! Wow! Wubbzy! A Tale of Tails." With day-glo colors and simple animation stylings, Wubbzy and his pals, Widget, Walden and others, will appeal primarily to kids in the pre-K to Kindergarten levels. However, first and second graders might get a kick out of Wubbzy as well. There are eight episodes (six original and two bonus) on this DVD. Each episode puts Wubbzy and his friends in different situations that teaches children positive values such as taking responsibility for your actions and not telling lies. My personal favorites are "A Tale Of Tails" and "Come Spy With Me." There are music videos in each episode as well. All are upbeat, positive and fun for little ones. The DVD extras are excellent. From printable coloring pages and invitations to a fun ring toss game (all accessible from your computer), this DVD goes above and beyond with it's educational and entertainment value. There's even an option that allows you to just watch the music videos. The kids love it, but it may lack "staying power"
As far as the show itself - it is very cute, pretty educational, and entertaining to the kids. It is "kooky" enough to present traditional lessons in a non-conventional way, so kids can get the message with silly songs and kooky premises instead of preaching. My reason for docking this a star is around actually owning the DVD. My kids have gone back to Dora, Blue's Clues, Cars, Nemo, (recently) Spongebob, and others OVER and OVER. I can't explain why some things click. Wubbzy is on TV a lot and while they will watch it and like it, it hasn't reached "repeat status", so I'm not sure the DVD will get much use. Then again, maybe this will "click" with your kid and you'll have positive messages being reinforced - which is a lot better than some of the other stuff out there. And for $10, I guess there's not that much of a risk! The game and printables on the DVD do add some value, so maybe I'll go to 4.5 stars! Wubbzy lives in a delightful world of color, and uniquely shaped characters set him a part from the wave of CGI animation. He can easily appeal to all age groups. A sensible, non preachy message is mixed within the commotion of story lines! Action often comes from the crazy Rabbit, Widget. As mechanical engineer Widget is constantly creating. His creations 3,000 all have their kinks, which Buddies Wubbzy, and scientific Pal Walden try to get on the right path. Leading to multiple kooky adventures. *DVD ROM Toss Game, Printable Features like coloring and party invites, Stickers to stick inside open DVD Case, Coupons off Chuckie Cheese Restaurant, and other kid and parent approved places, and services. * Silly, yet educational music video, encouraging children to respect other's personal belongings. Another suggests kids should be themselves, with one of the episodes going further into depth with this topic. * As with many cartoons there comes repetitiveness. One of two exist here, an orange character has resemblance to Wubzy. His/her walks/ runs/ enters in the heat of suspense. "Kooky", is all the creature will say. My 2yr old loves it. I debuted this DVD for my two daughters, aged 2 and 4, yesterday and they've been singing about Wow! Wow! Wubbzy! ever since. They'd seen this little guy on Nick Jr. so they already knew him but now they love him. The DVD is nicely packaged with a couple of inserts and a really neat cover that as you move it makes Wubbzy's tail move. The quality of the DVD sound is very good and the picture is terrific. It upconverts to 720p very well and looks very close to hi-def. The colors in the video are muted pastels and everything is shaped like a rounded box. The drawing style is very reminiscient of Matt Groening's "Life is Hell" mixed with anime. The characters are all very cute both in appearance and voice and very diverse (tall, short, wide, skinny, different colors, etc). The music is good and original with lots of allusion towards disco here and there in various situations. There's definitely plenty of nuance in here for the parents that goes unnoticed by the little ones that will give a chuckle. The DVD has 8 shorts with Wubbzy going on various adventures where he and the kids learn a lesson or two without the lesson being shoved down their throats. There's everything from diversity to patience to honesty taught to and by Wubbzy and his friends. In between some of the shorts are cute little music videos with some really catchy music and lessons of their own. It's nice to have a break from the cloying sweetness and over the top pandering from the likes of Dora, Barney, et. al. Most important of all though: my kids loved Wubbzy and his friends. I hope yours will too. This review is not based on my opinion, but rather, on my children's. I am not a fan, (however, a reviewer double dared you not to sing the song...don't take the bet, she's right)....I honestly do not see the appeal of this show. My kids (5 and 3) on-the-other-hand LOVE it, and since this is the target audience, I rate this 4 stars. My reasons for not awarding it 5 stars are based on comparisons to other current shows they enjoy that have better lessons, and, more important for me is how quickly images are flashed on the screen. As you may or may not know, there are correlations between ADD and fast changing scenes. That is a major concern for me, and it seems many of the shows switch images faster just to keep a childs attention. These are not as bad as others, but not the best out there. If you are not familiar with this series you can easily preview it on television on Noggin or Nickjr.com (I highly recommend previewing it). I am not going to repeat the descriptions that everyone else has stated. Suffice it to say your children will more than likely enjoy this DVD. I have found no problems playing it on my computer or DVD players. My 2 year old son loves Wow! Wow! Wubbzy! and this DVD is just perfect for him. Also, the price on Amazon was unbeatable. WOW! WOW! My Four Year Old Granddaughter Loves Wubbzy! Nick Jr.'s Wow! Wow! Wubbzy! is an animated preschool series created by Bob Boyle, a producer on Nickelodeon's The Fairly OddParents. Wow! Wow! Wubbzy! Centers on a curious little creature named Wubbzy, who lives in the mythical city of Wuzzleburg. With the help of pals Widget and Walden, he tackles everyday kid problems so he can pursue such interests as chasing flutterflies, eating ice cream and playing his favorite game, kickety kickball. Widget is a mechanical whiz and inventor who owns her own fix-it shop, and Walden a bespectacled fellow,loves music and art and is a quirky scientist. Wow! Wow! Wubbzy is a great show for kids and adults alike. It teaches kids a lesson in each episode and lets kids know that they can be whatever they want to be. My neice and nephews love it! I've seen "Wow Wow Wubbzy" on Noggin and thought it was a pretty cute show, especially compared to some other shows that are featured on Noggin and Nick Jr. The world of "Wow Wow Wubbzy" is cute and colorful as are the characters. Also there's something about this show that kids love. Everytime that I put this DVD in for my 5 year old neice and 2 year old nephew to watch, they just sat and engrossed in it. It's like it hypnotised them or something. It made me laugh. From an adult's point of view, I found "Wow Wow Wubbzy" to be entertaining and certainly tolerable to watch more than once. My neice's favorite episode on the DVD is "Special Delivery", while my personal favorite is "Attack of the 50-Foot Fleegle". One confusing part of the show for me, is that Wubbzy is being voiced by a woman (some will recognise the voice as that of Emily Elizabeth's in "Clifford") but Wubbzy is supposed to be male. I am NOT one of those parents that sees childrens programming & thinks it is great just because my girls can learn while watching. I am glad that my daughters learn in an entertaining way, enjoying education is of exceptional value, but a lot of the "educational" shows now offered tend to annoy me to no end; granted, I am an adult (more in age than in action, my wife might assert), but I don't like teaching that offers information in a patronizing manner. Many times, tutelage is discreetly presented with a dumbing-down of the information being introduced, reflecting condescension rather than providing the impetus needed to stretch young minds, far more intelligent and acute than we ever realize. That being said, this show is, in my humble opinion, one that is less annoying; it's not offering a blatant lower-the-bar type of instruction than many other kids shows seem to peddle. Important in you decision? Perhaps not; I am a little out there in my teaching methods with my girls. I allow fun shows with no "educational" value (at least according to the US Dept of Education) and use even those to help them see examples of good/bad, right/wrong, true/untrue, because it is good that kids can learn when they have their TV time and they shouldn't have to be bored when they earn that special treat; and I can't abide a show that teaches with a method that comes across ridiculously rudimentary. Give the kids some credit. Many would excel, given the opportunity. This show presents excellent social & personal messages for youngsters growing up in this crazy time; self-confidence (understanding that all are different & differences make us special), good manners (when did please & thank you get dropped from daily conversation), honesty, dealing with problems with a positive attitude, curiosity or interest in the unknown, a willingness to learn or try something new, patience, respect for others, & the power of trust & friendship, to name a few. It is done in an entertaining way, with fun characters, easily understood explanations of personal values, & with an overriding theme that team-work reaches a goal and is better than facing troubles alone. There are other more "educational" programs for sure, but this is one of the few that fully entertains, silly & fun, as it teaches, without being downright annoying to the parents that watch with their kids (and I don't mean that selfishly, when one watches children's programming, it is nice to have things mixed-up occasionally). Disney does this with their movies, providing adult oriented humor in a child's movie. It is an excellent way to win parent & child instead of relying simply on the child's opinion. Go after the people with the money. At any rate, I thought about a 5, this is a very viable tool for a young person's growing intellect which is being assaulted from all sides. In the end, I decided to offer a rating between 4 & 5. 8bit fun in a responsible package! Wow wow wubbzy, wubbzy wubbzy wow wow! - ok now this song is burned in my skull I must say this is a great pack of shows! My two children ages 2 and 5 love Wubbzy because he is a fun character. What I love about Wubbzy is how each of the stories have a moral tale or lesson to them. The animation is reminiscent of the old days of video games and is bright and inviting. Wubbzy is the ultimate optimist. Always curious and willing to listen to advice when the time is right, makes for a wonderful role model. This collection of shows on a single DVD is actually the same as shows you can see on TV. However, there are 2 episodes that currently are not on TV. These are Mt Fizzy Pop and Puddle Muddle. You also get a fun music video. If you insert it on your computer you can print out some great activities to do with your kids. Highly recommended for any family! Wow!, Wow! 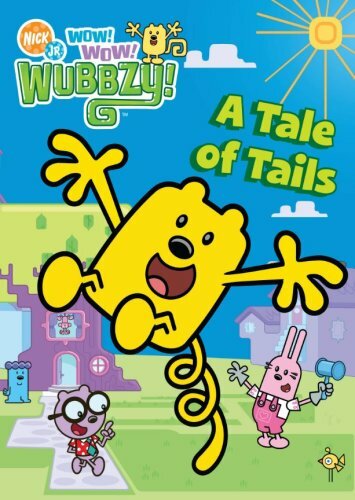 Wubbzy!, A Tale of Tails is a cartoon about a little yellow critter and his friends. There are a total of 8 episodes on the DVD with some bonus features also. The cartoon characters are very cute and the stories are equally cute with a good moral to the stories. That is refreshing in cartoons today. We had never seen Wubbzy before because we do not have cable but we were quite pleased with the DVD and Wubbzy. My 3 year old has watched it over and over. I think any preschooler or kindergarten age child will love Wubbzy. I have to admit that I enjoyed watching Wubbzy with my son. I especially enjoyed the episode titled "Attack of the 50-ft Fleegle", which is an episode in which Wubbzy gets a pet but does not follow the instructions that come with him and the Fleegle grows and grows from eating; a very cute cartoon. 4 year old LOVES it!!!!! Everybody every age needs a littly Wubbzy in your day! Not just cartoon, music, printables& game! Excellent cartoon for all ages. Grandkids,2 & 4 stayed glued to tv for hr & half. Even my boys 8 & 10, request to watch this every 2 days or so,they love this. I hear them laugh every few minutes. My boys favorite episode "Attack of the 50- Foot Fleegle". About Wubzzy getting a pet and not following instructions spoof of the Gremlins movie. Adults love it too. My daughter,30, and I,49, also enjoy the cartoons. Brings a little laughter and sunshine into any dreary day. I especially love the extras :Ring toss Game- wher the kids thry to catrings on Wubbz's tail; coloring pages you cna print from you computer; party printables -invites and ideas; and music videos. I was given the opportunity to watch and review Wubbzy's first release on DVD. Having a one year old I thought I'd give this a try. So glad I did. In times in which kids watch cartoons like Sponge Bob and the like (filled with absurd situations, jokes that sometimes may not be directed for kids and characters drawn in odd ways) Nickelodeon offers a fresh TV show: Funny and colorful characters, catchy tunes, cool flash animation and educational on values rather than colors, numbers, etc for preschoolers. And I guess the latter is what I liked the most, every episode has a situation that Wubbzy and friends have to resolve: "A tale of tails" talks about the importance of accepting yourself the way you are and look; Another episode has Wubbzy telling a lie (the episode ends with a catchy song "Lie, blame it on the other guy") and in the end he understands that when someone lies the truth will eventually come up; then there's this episode in which Wubbzy opens a package that does not belong to him (with another funny song "look, look, look, don't touch!") and I guess you get the idea. The episodes run a little over an hour. The DVD comes with a 3D cover and does not include subtitles at all (though it is closed captioned), language tracks included are English and French. Some of the extras include the isolated song videos as well as two bonus episodes. First of all let me say that my son is 3.5 years old so this review is based on watching his response to the Wubbzy DVD. He had never seen Wubbzy prior to seeing the DVD. While he enjoyed watching the DVD in its entirety, he was not laughing out loud (like he does while watching cartoons like Curious George or Sitting Ducks). Wubbzy also does not offer much educational value compared to cartons like Caillou or Super Why (on PBS). - Has bonus DVD features such as extra episodes, a music video, and a game. - Not something that parents can really watch with kids (like the old Bug's Bunny or Tom and Jerry cartoons). - The characters sometimes use created words like "flutter fly" which, at least in my opinion, can confuse young kids about proper words and terminology. My son who is 1.5 years old, just loves this dvd. There is a lot of shows recorded on this dvd. He shouts WOW WOW WOW for me to put it on for him. Keeps him entertained and he enjoys watching it. The loves to hear the tunes in Wow Wow Wubbzy to the point that he gets up and dances. So at least i know my son is not being a couch potato but he is also being active at the same time. I too like to watch it with him, it's a very cute show that tells you about morals and to do good things in life. As a parent, this cartoon is a bit difficult to watch. Kids love it. Isaac insisted that we take it on vacation with us, so he could watch it in the van. Parish is just as excited about it. Wubbzy is a yellow square that has a springy tail. He is a bit wacky and gets into silly situations. The simple story lines and simple animations draw kids in. There are underlying morals in each cartoon. The cartoons are short, so kids do not become bored. Parents may not enjoy this, but they will enjoy the fact that it keeps kids entertained. Little ones think Wubbzy is hilarious ! When we had DirecTV, my son enjoyed watching Wow Wow Wubbzy. Me, I enjoyed the upbeat, funny rhyming "music videos"! For those unfamiliar with the show, here's the low down on the three main characters: Wubbzy is a yellow square-like creature with a twisty tail, and his favorite thing to play is "kickety-kick ball". His friend Widget is a pink creature with rabbit-like ears who loves to fix or invent things (often ending her creations in "3000"). Walden is a bespectabled creature who is the intellectual of the group, enjoying learning new things and dispensing information. On the menu, there is the ability to play just the "music videos" interspersed within the episodes (sadly, for me, "It Doesn't Have to Be By the Book" isn't on this particular DVD). The DVD-ROM features are a Ring Toss Game, Coloring Pages and Party Printables for a "Wubb-ified" party. The insert also includes an image search game How Many Wubbzys Can You Find? If your child is a rabid fan of Wow Wow Wubbzy, he/she will likely enjoy this colorful DVD. While the cartoon might irritate parents after a while, there are some great social lessons in this DVD (such as not touching the property of others without their permission, self acceptance when "different", and the consequences of lying), as well as catchy, upbeat tunes reinforcing these lessons. Eight episodes. 92 minutes. Already this release is a better value than most children's releases these days that tend to hover between 50-60 minutes of entertainment (though we all know that 50-60 minutes entertainment is actually worth days on end to youngsters). Wubbzy is a yellow gerbil-looking little guy that walks around amazed by everything he sees (often exclaiming "Wow! Wow! Wow!"). His pink rabbit-looking friend Widget who attempts to solve any problems that Wubbzy happens upon. A show that both my 5 yo and 1 yo enjoy! This is such a cute show, with catchy music (that both my kids love to dance to). My 5 year old sings the song all day. Each show has a nice moral lesson, usually about how to treat your friends. The plot is enough to hold the 5 year olds attention, but colorful and musical enough to hold the attention of my 16 month old. Our almost-2-year-old daughter is absolutely fascinated with Wubbzy. In fact, we use the DVR to tape new shows on a regular basis. Having the DVD is nice, but not a deal-breaker for us, because the shows are all the same shows we've seen repeatedly on Noggin. The only really good thing about the DVD is that we can take it on car trips (we break out the DVD player as a last-resort when said daughter is on the verge of a meltdown).